Limit Random Facebook Adds: By changing your privacy setting, you can limit the possibility of receiving Facebook adds or friend requests from total strangers. 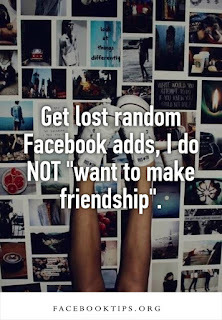 Do you get friend requests from strangers or people you hardly or don't want to know? One likely source of such requests is people seeing your profile in the People You May Know box that sometimes appears to the right of the News Feed. Go to your Facebook privacy settings by clicking on the downward arrow in the upper-right corner and selecting Privacy Settings. Scroll down and click the Edit Settings link next to How You Connect. For the question, Who can send you friend requests? select Friends of Friends and then click Done. Now, only friends of your Facebook friends will be able to send you friend requests, I hope you found this article helpful? Kindly share with your friends.